...this set of tunes is a fine addition to the repertoire." 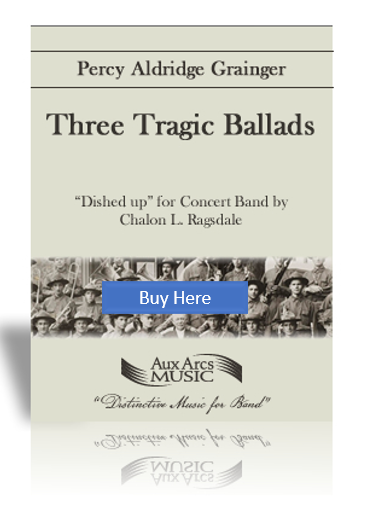 Three Tragic Ballads is a Grade 6, well-suited for the accomplished collegiate wind band. Duration 14'. The Three Tragic Ballads - "Danny Deever", "The Three Ravens" and "Father and Daughter" - can be played as a set or individually. Father and Daughter Nr. 1 of the Settings of Dance-Folksongs from the Faeroe Islands. “Composed in 1908-9, it is scored in the original for five solo voices, described as ‘narrators’ because they tell the tale, with a double mixed chorus actively representing the ‘tribe’, and with three orchestral groups of brass, strings, and mixed mandolins and guitars (as many as possible).” (Wilfred Mellers in Percy Grainger). One of Percy’s most exciting pieces, John Bird tells us that, at the premiere performance of Father and Daughter at the Queen’s Hall in 1912, Grainger received twelve curtain-calls, and the piece had to be repeated twice!